In the following article, I’m going to show you how to (ethically) manipulate Amazon’s Kindle Direct Publishing (KDP) program to rank higher and sell more books. As you read through this “Tom Morkes Ultimate Guide” (trademark), please remember these words. In the spirit of education, I’m sharing some stuff that is borderline black-hat in the kindle / self-publishing world. Okay, so it’s not really close to black-hat because I’m not hacking anything; but the stuff I will show you can and sometimes is used by scammy self-publishers to game the system and make lots of cash. I don’t do this so you can be one of these sleazy internet-marketing-type kindle publishers that cranks out generic books written by $5 per hour ghost writers in the Philippines (not that there’s anything wrong with that), but rather so you can ETHICALLY use these tools to help your legitimately useful, well-written books rank where they deserve to (and conversely: beat out the people who are unethically manipulating the system for profit). If you want to ask me questions about ethics, whether the examples of fraudsters in this post are really fraudsters, or why iatrogenics are more dangerous than assault rifles, go ahead and leave a comment below. If it’s polite, I’ll respond. Now, are you ready to learn how to get your book to hit the Amazon bestseller list through the strategic use of Amazon Kindle search engine optimization? I am not an Amazon employee, I don’t know how their A9 algorithm works, and I don’t have any insider secrets. Neither does anyone else on the internet writing on this topic. So please don’t consider this advice – it’s just my experience with Amazon SEO. Further, what is working for me right now might not work tomorrow, and may not work for everyone. Amazon could change up how they rank books any time they want, just like Google updates their search engine algorithm whenever they want. Finally, Amazon may or may not manually manipulate book placement in the Kindles store; I don’t know, and they won’t tell me. So there. Please take this blog post as nothing more than how I’ve personally tested Amazon and my results. If you test the same things I’m showing you, you may have different results, because results vary. In fact, your sales and ranking could go down – I don’t know and can’t guarantee it. So be careful! When in doubt, consult a doctor, lawyer, or Amazon support. Because some people are visual learners, I decided to record bonus instructional video that will walk you through the entire process I’m showing you here. It includes copious examples, additional insights, and more. Warning: this is not for people who just want to dabble. If you just want an overview, stick to the article. If you want to go into a lot more depth, watch the full 60 minute presentation: Note: this is the type of instruction I traditionally reserve for Publishers’ Empire students, but wanted to share what they’re getting so you know what you’re missing out on. If you’d like to join Publishers’ Empire, sign up here: www.publishersempire.com. In layman’s terms, Amazon Kindle SEO is all about ranking your book higher than other books for your keywords. Why does Amazon Kindle SEO Matter? If you have an awesome book that you know reader X will love, don’t you want reader X to find it, buy it, and enjoy it? In the simplest terms, Amazon Kindle SEO can help you with the first one, which means the latter two have a better chance of happening. Amazon Kindle SEO is important because it dictates whether or not people will find your book based on what inquiries they type into the Amazon search engine (or even Google search engine in some cases). If you’re not speaking the language of these search engines (which I’ll show you how to do in this article), then your book will not show up where it is supposed to, and you won’t make sales (or as many sales as you could). Worse still, sleazy, internet-marketing-style self-publishers will game the system and poach sales that could potentially be yours because they know how to speak the language of the search engine. In conclusion: Amazon Kindle SEO matters because your book deserves to be found, bought, read, and enjoyed – and without it, the first two probably won’t happen. How is Amazon Kindle SEO different than Regular Amazon SEO or Google SEO? Like Google, Amazon has their own search engine algorithm (A9), which is super-secret. Anybody that says they can tell you how it works is lying – at most, they’re giving you a best guess (like me). Amazon ranks things based on what they think you will buy. Google ranks things based on how best to satisfy your inquiry. I only make this point to say that a lot of people conflate Google SEO with Amazon SEO. While there’s no doubt a correlation in many cases to what people search on Google to what they search on Amazon, there’s no way to tell for sure, so things like Google Trends, Google Adwords, and general Google SEO advice are good, but can only take you so far. The fact that Amazon optimizes for sales conversion is important because if you have a book on Amazon that perfectly fits a keyword, another book with similar keywords but higher sales conversion (more people who visit that page buy versus your page) will probably rank higher than you on the search results page. Amazon is in the profit-making business, so this makes sense. This is important because, in Amazon, optimizing for sales is paramount. In other words: nothing beats a good book with good word of mouth! In regards to Amazon versus the Kindle store: to my knowledge, the difference between the regular Amazon store and the Amazon Kindle store is primarily in how pages are laid out and specifically what you can include on said page. The regular Amazon store includes a lot more options than the Amazon Kindle store, and a lot more versatility in terms of tracking and comparing sales rank, knowing how things are selling, etc. For our purposes, this won’t affect us. Just know that a lot of content on the internet on Amazon SEO is about the general Amazon store, not about the different, unique Kindle store. While the above is in reference to Google SEO, the important element here is that keywords (both individual words and specific phrases) help potential readers find you inside the Amazon Kindle store. Replace “website” above with “Amazon book sales page” and you get the idea. Kindle Direct Publishing, or KDP for short, is the place where you go to self-publish your book on Amazon.com. Inside KDP is where you can add your book files (cover and interior), set the price for your book nationally and internationally, as well as complete your Amazon book sales page (title, subtitle, description, etc.). You can access KDP here: https://kdp.amazon.com. When or if I make this reference, I’m talking about the actual page where you will find your book cover, title, description, and buy now button on Amazon. What you do in KDP affects your Amazon book sales page. Okay, so this is nuanced but important. Throughout this article I’ll talk about keywords (lowercase k), as per the definition above. Toward the end, I’ll also make reference to “Search Keywords” which are specific keywords you can set inside KDP. These are different than regular keywords because they impact what CATEGORY your book appears in. I’ll show you how to leverage this to your advantage later. I’m writing this section a week after I finished this blog post (which took two weeks). I realized I didn’t actually show you how to find keywords and phrases for your book. Silly Tom. So I want to briefly walk you through how to come up with your keywords and phrases (or at least give you some basic guidance). That’s right, Amazon itself will be one of your best insights into what keywords you should rank for. Let me start from the beginning, and then I’ll get to why the latter is true. For more get info on SEO, check out this Moz article. 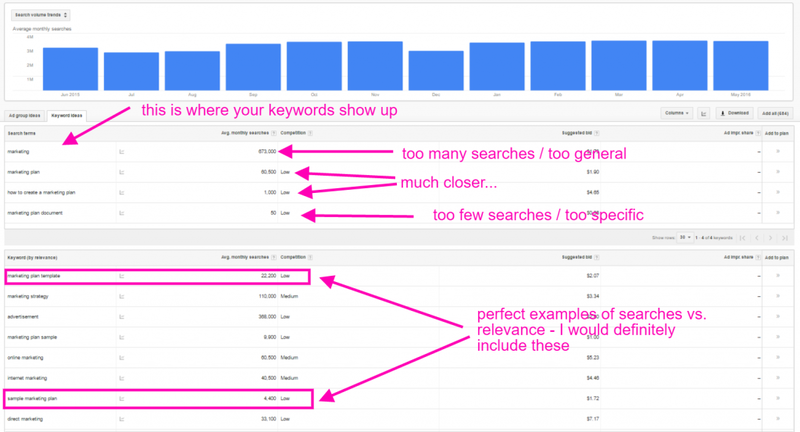 Yes, that’s painfully simplistic, but it should get you started (and is better than doing no keyword research). There are several items that need your attention when it comes to properly ranking your book in Amazon. The main elements are identified using a framework my friend Dave Chesson of Kindlepreneur.com dubbed: “S.T.A.R.S.,” which stands for: Subtitle, Title, About, Reviews, and Sales Conversion (not to be confused with the Special Tactics and Rescue Service of the Raccoon City Police Department). I sat down with Dave to get the low-down on Amazon Kindle SEO and his S.T.A.R.S. framework. As I mentioned, S.T.A.R.S. stands for: Subtitle, Title, About (book description), Reviews (user and editorial reviews), and Sales Conversion. Each one of these areas is something you can tweak inside Amazon Kindle Direct Publishing to increase the likelihood of your book ranking for certain keywords. In the following sections, I’ll explore each area in depth with examples. Below is a screenshot of “The 1-Page Marketing Plan” Amazon book sales page to give you an idea of where the elements of S.T.A.R.S. are visually represented on an Amazon book sales page (full disclosure: my company, Insurgent Publishing, helped market and launch this book, and I will use it as an example throughout). The first “S” in S.T.A.R.S. refers to your SUBTITLE. You want to start with your subtitle before your title because it affords you the opportunity to add many more keywords and key phrases than your title will allow. While a title requires something short and sweet, a subtitle’s can include a lot more keywords and phrases while still appearing natural. For example, Jeff Walker’s book “Launch” includes a catchy, pithy title that is memorable, but maybe not clear to the first time viewer (“Launch what? A rocket?”). Sure enough, as of this writing, if you search either “internet millionaire” or “build a business,” you will find “Launch” in the #2 spot on both search result pages. With regards to SEO, your book title comes after your subtitle because your title needs to be catchy, interesting, and compelling first and foremost. Therefore, keywords in the title take a backseat to your subtitle (plus, S.T.A.R.S. is a lot easier to remember than T.S.A.R.S., which sounds like a disease). Remember: while your title is important to the Amazon search engine, it’s also the only element of S.T.A.R.S. that is visually represented through your cover image (subtitles are usually too hard to read when scanning the Amazon bookstore). When it comes to your title, you need to focus on your marketing angle, and then figure out a way to integrate keywords into it naturally. Ideally, you would do this type of research before you begin writing your book, but even if you have a finished product you may want to play around with some variations to see what makes the most sense. 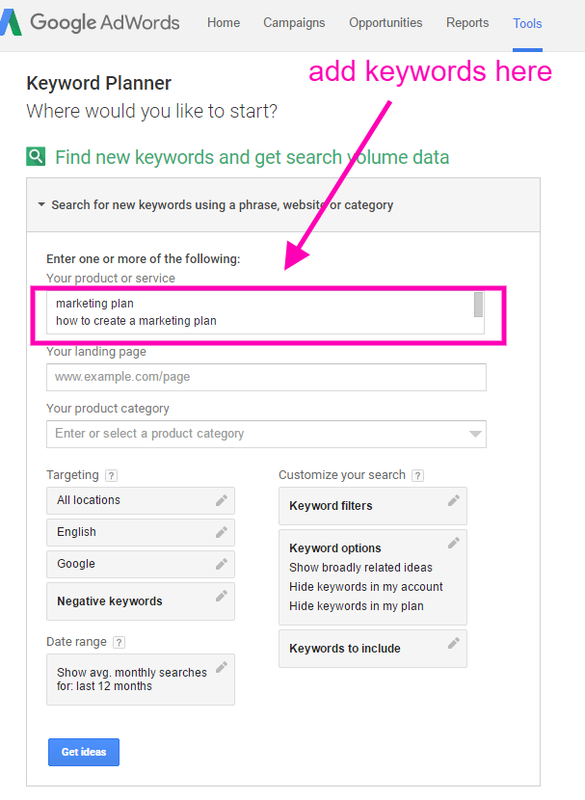 As you can see, when someone searches “marketing plan,” the first two titles both contain the phrase “marketing plan” in the title. As you can see by the example above, “The Best Little Marketing Plan” edges out “The 1-Page Marketing Plan” most likely because it includes the word “marketing” in the subtitle, making it more keyword dense (I assume this is the reason it is outranking the other book, because, as of this research, “The 1-Page Marketing Plan” is #2,010 overall in the Kindle store vs. “The Best Little Marketing Plan” which is #304,338 overall in books, so it can’t be sales or sales conversion that is pushing it to the top). When it comes to your book description, think of it like a blog post. If you want to write an effective blog that ranks in Google, you need keyword-rich, easy to scan and understand content. You also need to take advantage of proper html tags. “The Perfect Book Sales Page” is something I created to help authors construct a more compelling sales page. 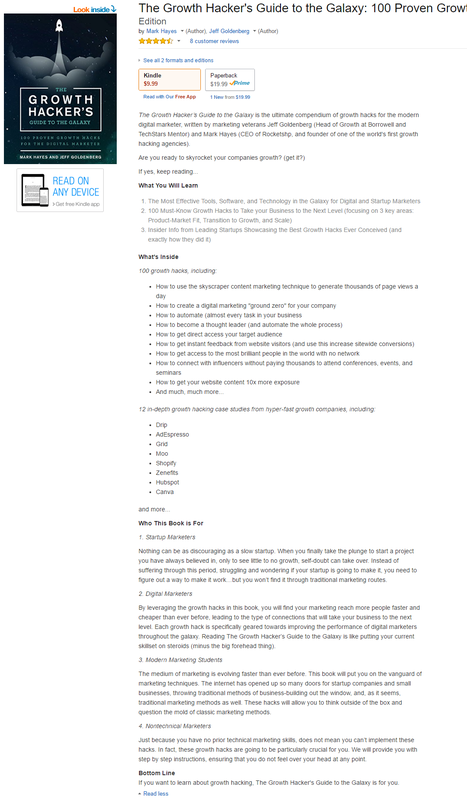 You can find “The Perfect Book Sales Page” template here. 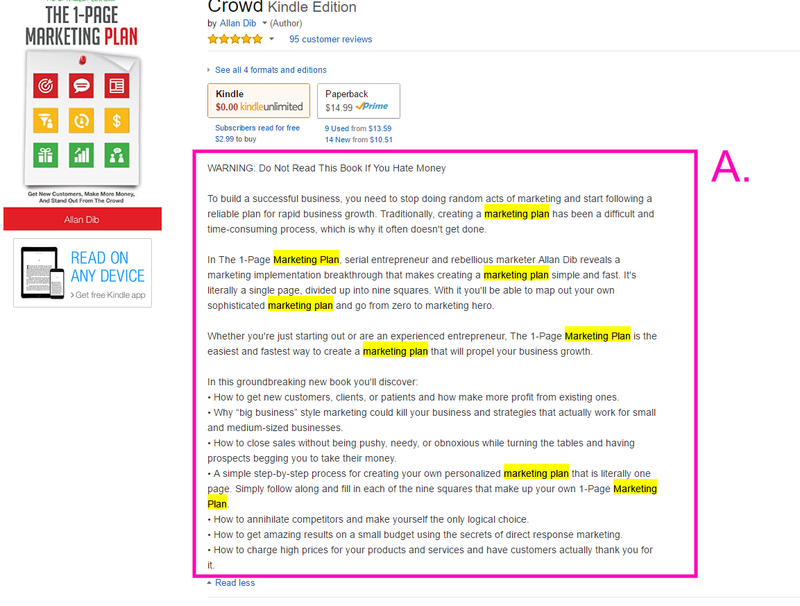 However, because I structured it for a sales page for your website, I wanted to make a couple changes on how you can essentially copy and paste into Amazon (two birds!). The reason I suggest this structure is that you can organically and naturally include your keyword(s). The book description area gives you a lot of room to use, so take advantage of it! Basically, if you want to rank for a specific keyword, makes sure you include that keyword using as many popular but relevant phrases as possible. For example, for “The 1-Page Marketing Plan,” we wanted to rank for “marketing” and “marketing plan” primarily. I recommend using Google Adwords Keyword Planner to iterate a couple dozen potential long tail keywords and relevant synonyms for your keyword, then play around with the phrasing and structure of your sales page before hitting publish. An html tag is something that allows <h2> tags, <h3> tags, etc. That said, no reason to go overboard with formatting. A little can go a long way (and too much formatting creates diminishing returns, can look spammy, and could potentially be detrimental to sales). Believe it or not, reviews by customers (and the “editorial reviews” area of your Amazon book sales page…more on that in a second) can impact your ranking in the Amazon Kindle store. To be clear, I don’t believe it’s a direct connection. I can’t confirm or deny that Amazon will rank a book higher if more reviews include a certain keyword. That said, if you research books that rank for specific keywords, then search how many times those keywords are mentioned in customer reviews on their Amazon book sales page, you might see a correlation. Whether that is causing a higher ranking for said keyword or just a correlation is unknown, but I will say this: Positive reviews increase the likelihood someone will buy your book (assuming they are real). A lot of positive reviews (50 or more is what I would call “a lot”) can help someone overcome that last objection to buying your book. And as I mentioned earlier, and as we’ll cover in more depth in the next section, the more people who land on your Amazon book sales page and buy, the more that will improve your rank for keywords you previously optimized for. So while I wouldn’t worry if people aren’t using your keywords in their reviews, if there is a way to facilitate it in an authentic way (i.e. making the title of the book a keyword is very helpful in this case), then it can’t hurt. This is another section of your Amazon Book Sales Page. It usually sits right below the “book description” area and right above the user reviews area (and author bio area if you have one…and you should). The Editorial Reviews area looks impressive, and can help a book really stand out if it includes great, curated reviews. Fear not: the Editorial Reviews area is completely editable by you the author. All you need to do is access the Amazon Author Central account (this is different than KDP). Once your Author Central account is created and linked to your book, you can add the best reviews you’ve received directly to the Editorial Reviews section of the page. Not only does this give you more opportunity to place your keywords and phrases, it’s just a great area to control the space of your Amazon book sales page. A lot of authors miss a great opportunity to present their book in the best light by NOT having any curated reviews in the Editorial Reviews area…don’t make that mistake! The final S in S.T.A.R.S. stands for Sales Conversion. Arguably the most important factor in making sure your book actually ranks (assuming you have the stuff above figured out), this is also the one area that is least able to be tweaked, controlled, or manipulated. After all – it requires real people to purchase the book with real money to make it positively impact your rankings. In other words, if you aren’t able to send interested readers to this page, or nobody is able to find your page, or if people DO find your page and they don’t buy…down goes your book in the Kindle bestseller rankings. So the question is, how do we “optimize” for sales conversion? The above combined with a a good sales page will hopefully drive more targeted, interested traffic to your Amazon book sales page, and hopefully your title, cover, book description, and reviews will do the rest. A Search Keyword is a word or phrase you add to your Amazon book sales page through KDP, that helps Amazon know where they should place your book (what category). Search Keywords are very, very powerful when used right because they allow you to access any category in Amazon, even the “hidden” Amazon categories (ones that require a specific Search Keyword to get your book in them). You can find a list of categories and “hidden” categories here. Disclaimer: you can easily manipulate Amazon KDP to become a bestseller (where you get that little orange badge in Amazon) by abusing this strategy. What I am suggesting here is to not go too far with it, but instead leverage creativity and restraint to find the best, most applicable, least competitive category in Amazon, at least for your book launch, before moving it into a more competitive, more relevant category. Most books are appropriate for a multitude of categories and subcategories. For example, you might have a nonfiction marketing book that fits into the very broad “Business & Money” category. This is usually the extent that people take their category analysis. The problem is, this sets you up for failure. The broader, more generic the category, the more competitive it is. The more competitive it is, the lower your book will rank in said category. The lower it ranks, the less likely people will find it when searching by category, and often, by keyword. 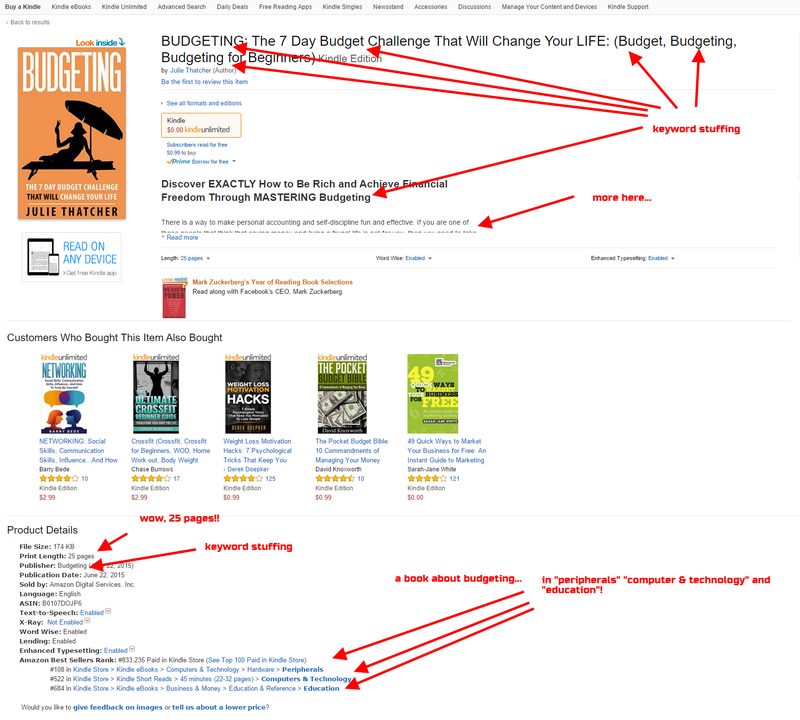 Broad Amazon Kindle categories are not where you want to start…too competitve! Do you really want to compete with the #7 book in the entire Kindle store? I’m being conservative when I say that book is probably selling several hundred copies a day. You might be able to knock it off for one day, but for most of us without internationally recognized names, that’s no easy feat, and something you don’t want to bet on. A better strategy is to go micro, and focus on sub categories. Going back to the marketing book example, there are dozens of categories and sub categories you could choose from, from “Marketing and Sales” to “Entrepreneurship and Small Business” to “Business life” and more. Then in each of those categories are dozens more sub categories (and sometimes even sub-sub categories, which gets us into Inception territory). For example, “The 1-Page Marketing Plan” is a book that could have fit into any of the above. But after doing some deep-dive research into Amazon categories and their relative competitiveness, we found the least competitive, most relevant category to be Global Marketing. This is where a lot of potentially successful books wind up way outside the top 100 books in any category: they get stuck on the most “appropriate” category even if it’s broad, vague, and competitive. Much better to get a little creative and see what other categories your book could fit in while passing your “reasonableness” filter. Does this book make sense here? Could it? Would most people who see this book in this category be interested in this? If someone were to blindly buy a book in this category, and they chose yours, would they feel good about it? If the answer is yes to the above (at least with some certainty), then you’re on the right track. This process can either be done manually, or you can use the assistance of some paid tools. I personally like doing the manual part because it helps me see things I can’t with software, but either works. In this situation, neither is more appropriate as the book is all about creating yoru marketing plan (whether that’s for direct marketing purposes, web marketing purposes, or something else). 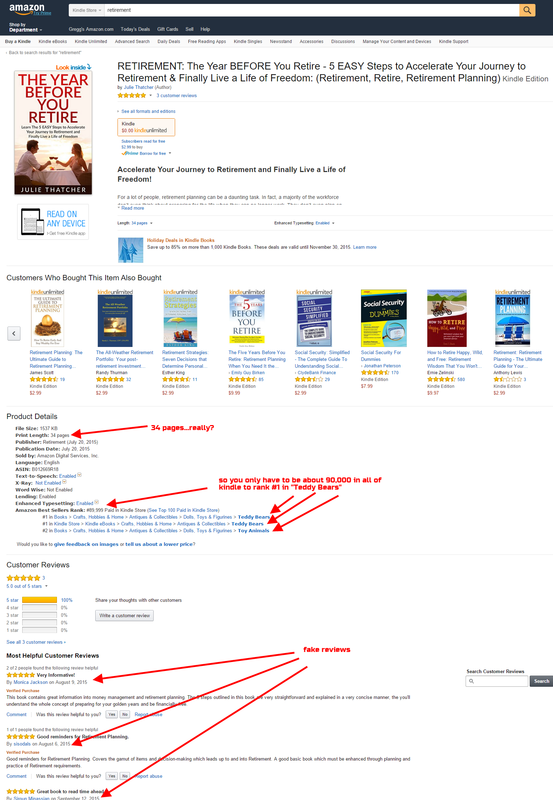 And here’s the #1 besteller in “Web Marketing” in the overall Amazon Kindle store: Which one is less competitive? If you chose “Direct” you are correct. And if you were writing a marketing book, it would make more sense, if the book is an appropriate fit, to get it into the “Direct” sub category. So now the question is, how do I actually get into these categories? Step 1: Choose your broad, main categories inside KDP (you can choose two) Step 2: Type the exact name of the sub category as a Search Keyword inside KDP Now you will most likely find your book inside the sub category of your choosing. Pro tip: if you don’t see it in there, make sure to contact Amazon support either via KDP or Amazon Author Central (I do both just in case and directly asked to be placed in certain categories). Okay, so now I’m going to show you an example of how someone used these techniques in a very shady way. This is just one of many examples you can find on Amazon if you spend as much time there as I do on a regular basis. For the record: I disavow the way this person used the techniques and strategies I’ve shared above. While these internet-marketing-style hacks, like keyword stuffing, work in the short run, you are much more likely to be dinged by Amazon if they catch on (or completely booted from the store). I’m sharing this with you to show you the extreme end of Amazon Kindle SEO and how it can be used to manipulate Amazon’s search engine in the wrong way (i.e. getting people to buy a book that maybe doesn’t deserve it). And what I found was the book was ranking #1 in all of “Teddy Bears” and #2 in “Toy Animals”…yet nothing else on the page made any references to toy animals or teddy bears. What this person is doing is using inappropriate, non-competitive categories to get the “#1 Best Seller” label in Amazon, while then keyword-stuffing to be found by her IDEAL reader. To get her audience to see the “bestseller” badge next to its name, making it seem like a legitimate bestseller in the retirement” book category. Pretend you’re browsing the Kindle store for your next purchase. You type in the topic you’re interested in (e.g. “retirement), and you see the number two book that pops up has a “Best Seller” badge next to its name. 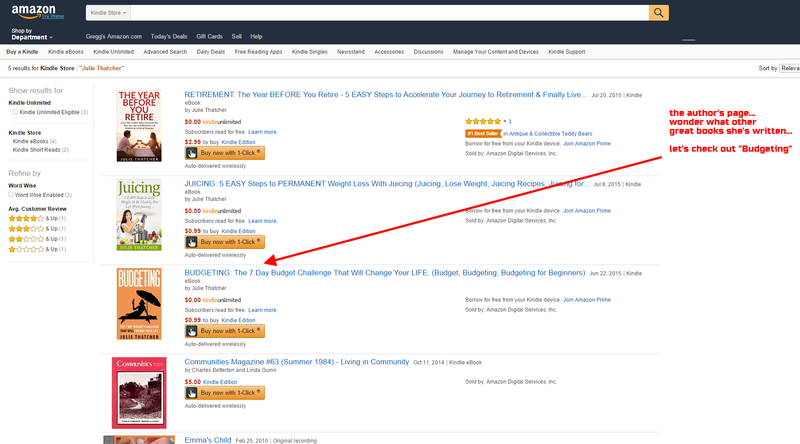 What you probably didn’t do is stop to confirm whether this book was a bestseller because of it’s enlightening content on how to save for retirement, or because it’s competing in the “Teddy Bear” category of Amazon. You are forgiven for not catching this. Here I did a quick cntrl+f search for “retirement” to see how well this person applied the S.T.A.R.S. framework. This is classic keyword stuffing. Not only is the keyword in the title and subtitle (3 times in the subtitle alone), but they included it 24 times in the book description (! ), and the book was even PUBLISHED by “retirement.” I’ve not heard of this publisher, but they they sure seem to be in the right niche… The author also did a great job getting reviewers to use the word “retirement” in EVERY. SINGLE. REVIEW. That’s certainly an eclectic range of interests….and every review is positive. Hmmm… Oh, and every reviewer’s background was like this. Okay, they’re fake. Impressed, I decided to search what additional heaps of value this author was producing for the casual Amazon Kindle store customer. Turns out, she(?) is a jack of all trades, with expertise in a wide range of topics, from “juicing,” to “budgeting.” I decided to explore some of her other books to see if she applied the same tricks…. UPDATE: several of these books do not exist any more in the Kindle book store…I assume she(?) will republish them periodically until negative reviews catch up, delete, then republish again (wash, rinse, repeat). Turns out, she’s cracked the code on budgeting as well. She even has a new, different publisher for her book on budgeting…the publisher? However, unlike “Retirement,” her book “Budgeting” is having a difficult time in the “Peripherals” Amazon Kindle book category, ranking a sorry #108 in that space. Okay, so enough blasting the fraudsters on the Amazon Kindle store. No matter where you go, online or off, there will be someone gaming the system. I don’t really care about that; it is what it is. But I DO care that you are equipped with the right tools, resources, and strategies to ethically increase the rank of your book, so you can effectively combat the scammers and fraudsters out there. Like I mentioned earlier – please use this information for good, not evil. The world doesn’t need more spam… But it does need your great work. So go forth and do great things. Let me know what you thought of this article. Was it helpful? How could I improve it? Share this article with someone you know who is self-publishing. They will thank you (and so do I in advance). Excellent article Tom Fx Morkes I am using a keyword tool, http://app.scientificseller.com/keywordtool#/ and it works like a charm (without search estimates). Can’t wait to test Dave Chesson’s new keyword tool..
will test this out for sure. thanks for the kind words Harshajyoti! Tom- such useful information on keywords, subtitles, categories, and using the descriptions. I probably ought to go back to my series of eBooks and make them more effective. I know I won’t ‘cheat’ (in categories) to get to #1, even #100 or #1000+. Not worth it to my personal regard for myself. It’s not about cheating but finding relevant, less competitive categories. Takes some time and creativity. I’m not suggesting putting yourself in the “teddy bear” category, but most books could reasonably be found in a dozen categories…so I would say definitely do some due diligence on that and find what works for you. SUPER article! Thank you Tom! It is well-written, thorough, informative, insightful, and very much appreciated. Thanks for showing us how to not only play the game, but how to WIN WITH INTEGRITY. Absolutely super stuff! This was great. I go to Kindlepreneur.com all the time, and Dave’s style and advice always give full value. Your article is also comprehensive. However, for fiction writers–so much of this kind of SEO is not possible. We can’t legitimately stuff subtitles, and it is rare to see headlines in fiction book descriptions. Some HTML for bold and font size, or italics, comes across–but for fiction it is not so useful to sell in this way. Not to mention the idea of niches is not so workable–competition in fiction has no reliable niches with numbers under 2000. That said, working off the top 3 rankings in a category or keyword phrase does help us hone in on refining our choices. Nick Stephenson gives advice on fiction, but it is not as accessible as this article. I hope one of these days you and Dave have a session on fiction only. Thanks! believe it or not, this works for fiction…but can come off looking odd when you add to the subtitle things like “vampire thriller” etc. another, possibly better strategy, is to get people who purchase your book to purchase a popular book in the same genre…this can increase the chances that your book shows up below the popular book as “books other people purchase.” just a quick hack i thought might help you. enjoy! Your article is very insightful, however Search engine optimization of Amazon store requires continuous refinement to ensure compatibility with current search engine algorithms and is also useful in avoiding down-ranking penalties. Can I get your email id? Got some doubts regarding kindle ebook publishing? Can we figure that out?